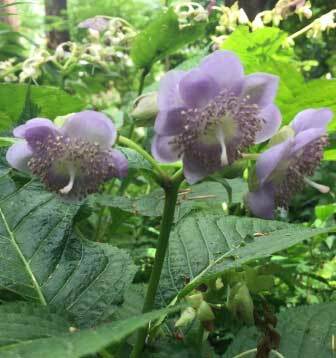 Many private gardens have signature plants that might be a tree or shrub, or perhaps it is a plant(s) that we buy new every year. 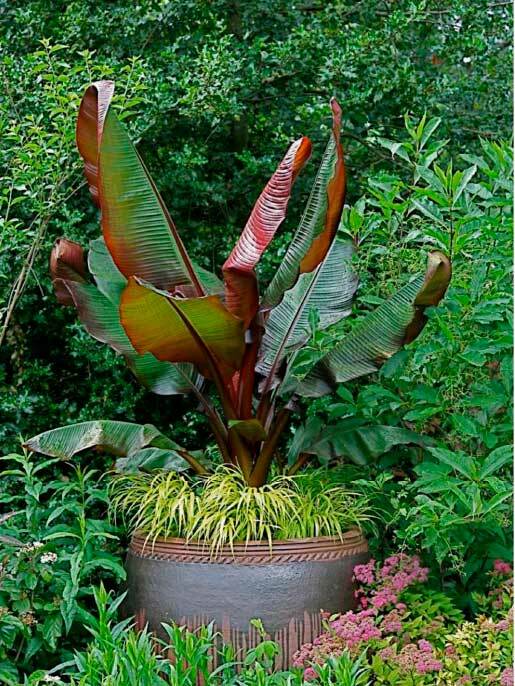 In my garden, I would consider my three red leaf banana plants (Ensete ventricosum ‘Maurelii’) as signature elements. I have three giant pots. Each spring I buy three of these plants and they become specimen plants throughout the summer. And where did I get the idea for growing these in pots? From visiting another gardener’s garden. This year there were almost 100 different private gardens to choose from. Gardens began opening in April and some have open dates into October. Many gardeners open their gardens more than once in a season. This provides the visitor with the opportunity to view how the garden looks at different times of the year and which plants are blooming when. In addition to seeing plants that are new to me, I often see old, familiar plants that are used in creative ways. Maybe there is a container with a mix of familiar plants that I might never have considered putting together. I might end up stealing this idea for my own garden. I might also alter the plant assortment and make it my own, still realizing that the original idea came from somewhere else. If you work at a garden center, appreciate this opportunity. It could be a chance to deepen your understanding of what avid gardeners really want. This information can then be incorporated into your buying and marketing strategies. Certainly spring is a busy time of year for buyers to be out of the store, but no doubt, it’s the best time of year to visit private gardens. Garden center buyers have a tendency to stick to the tried-and-true plants that account for the bulk of their plant sales. However it is imperative for garden center personnel to visit private gardens to learn what gardeners are buying and how they use these plants in their gardens. While the demand for traditional plants is going to continue to produce the largest volume of sales, there is another market out there for the plants that are not as well known. While this market might be limited, there’s probably minimal competition from the box type stores, making it wide open for you. Open garden visits may also help by inspiring new ideas for selecting other plants and creating imaginative displays. Tapping into this large and diverse resource may pleasantly surprise you. The result could make a difference in your business plan.